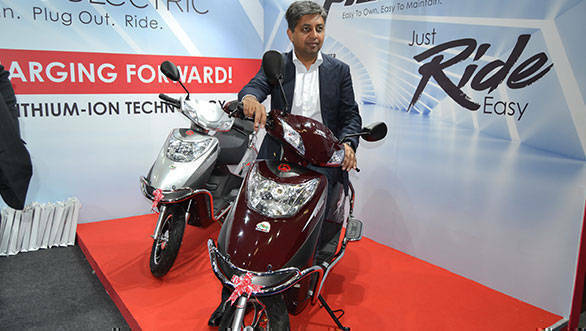 Hero Electric has launched its latest e-scooter Flash at the ongoing GMX show at Pragati Maidan, Delhi. Aimed at the first time e-vehicle buyers, the Flash is priced at Rs 19,990 (ex-showroom, Delhi). This, as Hero Electric claims, is easy-to-own and easy-to-maintain two-wheeler in the country. The e-scooter is powered by a 250W motor coupled with a 48V, 20Ah VRLA battery. Hero claims the Flash can cover a range of 65km on a full charge with a top speed of 25kmph. The Flash also comes with complete short-circuit protection and under-the-seat storage facility. Hero Electric will sell and service the scooter through its 350 outlets across India. Commenting on their latest e-vehicle, Sohinder Gill, global CEO, Hero Electric, said, "It weighs only 87kg, helping it score very high on manoeuvrability. Mag-alloy wheels, telescopic suspension and a full-body crash guard will further enhance its popularity among users and drive greater adoption for e-vehicles in the country." The vehicle is available in two colour options  red black and silver black  and does not require a driving licence or registration in order to ride. Hero Electric is also planning to launch two new vehicles - a smart scooter and a low-speed e-scooter. These top-of-the-line scooters will be powered by a Lithium-ion battery with a claimed range of 60-70km. While the smart scooter will be launched in the second half of this year, the e-scooter will be launched in March 2018.